Occupation begins by introducing us to a group of Australians, including Temuera Morrison (Aquaman), Dan Ewing (Home and Away), Stephany Jacobsen (Terminator: The Sarah Connor Chronicles) and Rhiannon Fish (The 100), who are all attending a country fair that has been organised to try and drum up support for a small community that is in danger of dying due to a road bypass that is being built in the outskirts of the town. The event starts off pretty uneventful until, in front of an amazed townspeople, bright lights appear on the horizon. Rooted to the spot they only realise that somethings horribly wrong when, as they get closer, the bright lights are revealed as alien spacecraft and pretty quickly their small town is being annihilated by an airborne attack. Forced to flee as the aliens start to roundup the townspeople a small group of survivors evade capture only to find out that they are among the last remaining survivors of an extra-terrestrial invasion that’s engulfing the whole planet. As humanity falls under world-wide occupation, the small group form a home-grown army in order to fight back against the vastly superior and utterly merciless alien forces. 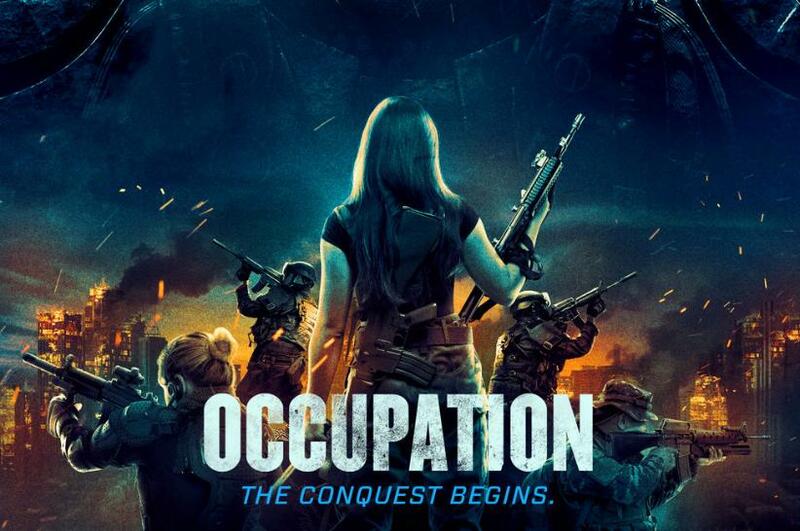 Occupation has big shoes to fill billing itself as Australia’s answer to Independence Day. To be honest Occupation has more in common with Doctor Who than Independence Day. Ropey special effects and a limited budget making it feel more like an extended episode of a television programme than a glossy blockbuster movie. Ignoring the many plot holes, the fact that it looks cheap, it’s corny and slightly overlong, there’s still a lot of fun to be had. The story moves along at a fair speed and the cast of mostly lesser known TV stars all give charismatic and likable performances. It might not be the best science fiction movie ever made, it might be the cheapest, but if you watch it with your tongue firmly in your cheek Occupation makes for a good couple of hours of brainless entertainment.